The localization of isoprenoid lipids in chloroplasts, the accumulation of particular isoprenoids under high irradiance conditions, and channelling of photosynthetically fixed carbon into plastidic thylakoid isoprenoids, volatile isoprenoids, and cytosolic sterols are reviewed. During leaf and chloroplast development in spring plastidic isoprenoid biosynthesis provides primarily thylakoid carotenoids, the phytyl side-chain of chlorophylls and the electron carriers phylloquinone K1, α-tocoquinone and α-tocopherol, as well as the nona-prenyl side-chain of plastoquinone-9. Under high irradiance, plants develop sun leaves and high light (HL) leaves with sun-type chloroplasts that possess, besides higher photosynthetic CO2 assimilation rates, different quantitative levels of pigments and prenylquinones as compared to shade leaves and low light (LL) leaves. After completion of chloroplast thylakoid synthesis plastidic isoprenoid biosynthesis continues at high irradiance conditions, constantly accumulating α-tocopherol (α-T) and the reduced form of plastoquinone-9 (PQ-9H2) deposited in the steadily enlarging osmiophilic plastoglobuli, the lipid reservoir of the chloroplast stroma. In sun leaves of beech (Fagus) and in 3-year-old sunlit Ficus leaves the level of α-T and PQ-9 can exceed that of chlorophyll b. Most plants respond to HL conditions (sun leaves, leaves suddenly lit by the sun) with a 1.4–2-fold increase of xanthophyll cycle carotenoids (violaxanthin, zeaxanthin, neoxanthin), an enhanced operation of the xanthophyll cycle and an increase of β-carotene levels. This is documented by significantly lower values for the weight ratio chlorophylls to carotenoids (range: 3.6–4.6) as compared to shade and LL leaves (range: 4.8–7.0). Many plant leaves emit under HL and high temperature conditions at high rates the volatile compounds isoprene (broadleaf trees) or methylbutenol (American ponderosa pines), both of which are formed via the plastidic 1-deoxy-d-xylulose-phosphate/2-C-methylerythritol 5-phosphate (DOXP/MEP) pathway. Other plants by contrast, accumulate particular mono- and diterpenes. Under adequate photosynthetic conditions the chloroplastidic DOXP/MEP isoprenoid pathway essentially contributes, with its C5 isoprenoid precusors, to cytosolic sterol biosynthesis. The possible cross-talk between the two cellular isoprenoid pathways, the acetate/MVA and the DOXP/MEP pathways, that preferentially proceeds in a plastid-to-cytosol direction, is shortly discussed. 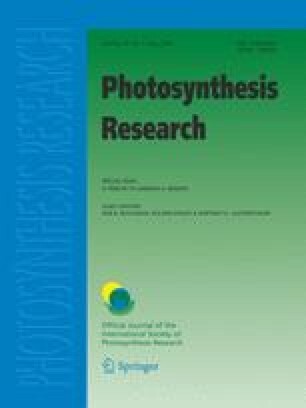 I am grateful to former Ph.D students and group members who carried out parts of the research on plant isoprenoid biosynthesis (T. J. Bach, C. Müller, J. Schwender, J. Zeidler) and chloroplast adaptation to high irradiance conditions (C. Buschmann, M. Knapp, G. Langsdorf, D. Meier, U. Rinderle-Zimmer). I wish to thank Professor Bob Buchanan for helpful comments on this manuscript, Ms Sabine Zeiler for long-term excellent implementation of pigment determinations, and Ms Gabrielle Johnson for English language assistance.